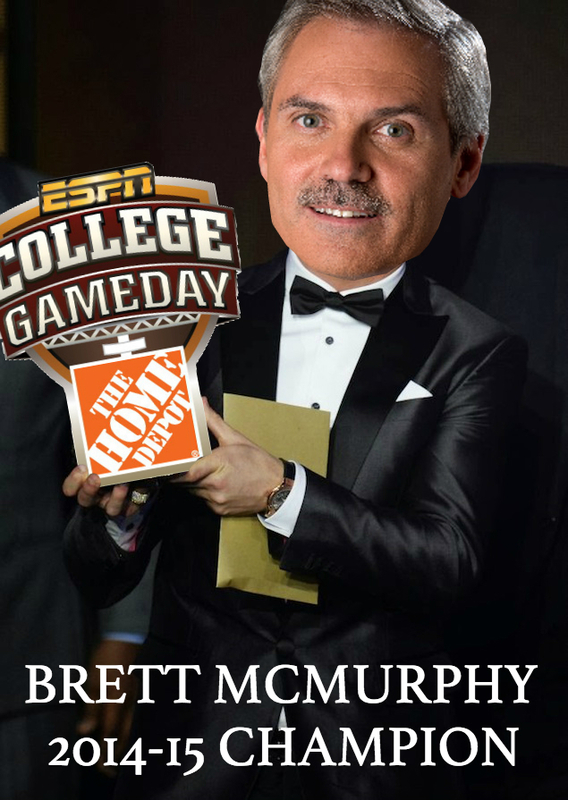 That means the man with the legendary mustache and legendary picking skills, Brett McMurphy, is your 2014-15 Gamedaycole.com season champion! Mark May came up on the short end of the stick, which I’m sure will amuse many of you. Going into bowl season, it was looking like our new buddies from the SEC Network were going to run away with this year’s championship along with Stanford Steve Coughlin. However, a disastrous bowl season doomed all of them to mediocrity, leaving Brett McMurphy as one left standing (barely edging out a great season by Lou Holtz and Jason Sehorn). Lee Corso’s headgear picks went 13-5 on the year (technically 14-5 with his espn.com EWU pick against SHSU), which means Corso’s headgear picks edged out Charley the Cat’s picks at 11-7 on the year. Better luck next year Charley. Our greatest week of the season goes to Phil Steele, who in week 5 went a stunning 15-0 on the week. The best pick of the year will be shared by Desmond Howard, Mark May, Jennifer, and the Oregon Duck, who all picked Virginia Tech to beat THE Ohio State Buckeyes in week 2. It was shocking when it happened, and makes even less sense looking back, so congratulations to all of you. Conversely, let’s give Desmond Howard the worst pick of the year, taking Oregon State to beat Oregon in rivalry week. Desmond Howard picked against Michigan twice this season, going 1-1 against his Wolverines. He also picked in favor of Michigan 7 times this season, going an impressive 2-5 with his home team. That will wrap things up for the 2014-15 season here. 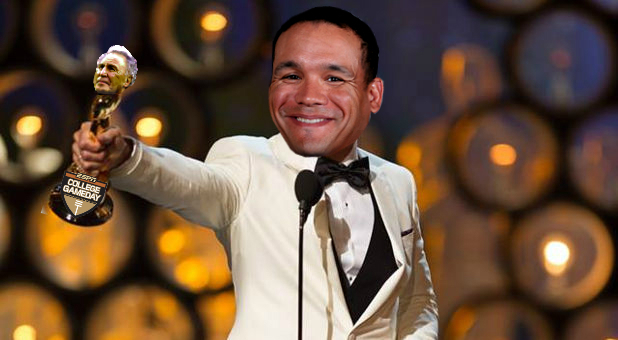 Who knows, maybe this will be the year I actually post something in the offseason? Last night was quite a performance by the Ohio State Buckeyes, and while they were the underdog in Vegas it should be no surprise to our panel of experts we tracked here. Our expert panel picked Ohio State to beat Oregon by a margin of 30 to 21. So let us all join in and congratulate the following 30 experts for being such geniuses in predicting the first College Football Playoff champion! And with all wins, there must be losses. Let us hang our heads in shame for all of the experts who took the favorite. Good game ladies and gentlemen. We will be tallying up bowl season records shortly, and then we will be crowning the 2014-15 GamedayCole.com season champion!